Facebook is the largest social media platform. We perform different type of tasks like posting status, photos, making friends and chatting with them. The basic reason behind Facebook addiction is chatting with friends. Almost every person who loves to use Facebook want to spent their time by chatting with each and every person who is online at that time. Facebook chat has many different features like text chatting, video chatting, stickers, attach files, photos and more. Chat box includes additional settings like turn on and off chat for specific list and people, play sound facility and many other. But for making user experience better, Facebook introduce two real time working features like typing and seen messages which appears on both users end. Typing feature is amazing but few people don’t like seen option. Just because after reading someone message seen option start appearing but problem is when we don’t want to reply that specific person then seen option creates trouble. Seen option is visible even chat is offline. Therefore, we are going to discuss about how we can automatically hide seen on Facebook chat messages. We have already discuss about many Facebook Tips Tricks and Hacks. So here is another tricks about how to disable seen on Facebook messages. Method 1st:- How To Hide Seen On Facebook Chat Automatically. How To Check Extension Is Working Or Not ? How To Disable Seen Extension On Browser ? 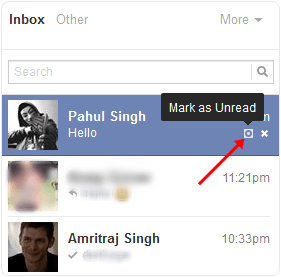 Method 2nd:- How To Read Messages Without Seen On Facebook Chat (Manually). Note:- This method is working only on Web version and only on the same device where you will install below given extension according to browser type. First of all install Below given extension. Choose and install above given extension according to browser type. After installing extension restart your browser. Now Login your Facebook account on that browser Seen option will not visible to your friends while doing chatting. Whenever someone send you a message simply reply or read that message. 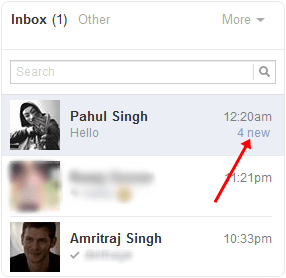 After reading visit to Message Box from Icon visible in navigation bar of Facebook. Now Checkout the color of that person message in inbox if the color visible is dark blue as compare to other messages after reading or just reload Facebook if the Mark as Read option is visible then extension is working. In case you want to stop feature. Simply go to Add-one option in Firefox or extension option in chrome. Click on the disable or remove button visible in front extension we had installed. This is simple process almost every knows. In case you don’t then must read about it. If you don’t want to install any kind of extension then the option available for you is, by it doing manually. To do this when someone send you a message then go to inbox area >> Read the message >> After that click Mark as unread option. Now for each person where you want to hide seen option.. Every time you have to click on Mark as unread option after reading his or her message. According to us if you really get irritating from messages then installing an extension is a good idea. If you like this method to hide last seen on Facebook chat. In case you face any kind of issue feel free to ask in comments. Previous articleShorte.st Review: Best Adsense Alternative! Really?